Apple brought out the heavy artillery at its annual Worldwide Developer Conference this week, announcing a handful of new devices and product updates that are poised to take on the biggest fish in their respective ponds. Equipped with an army of employees, the world’s most popular devices, and $250 billion in cash laying around, all tech companies should have a healthy respect — and fear — for Apple. TheWrap takes a look at three companies in particular that should be wary of the latest news out of WWDC. 1) Snap — Apple’s dive into augmented reality — the ability to add computer-generated overlays to the real-world — has been a long time coming. But it finally came to fruition with the announcement of ARKit, a tool on its new operating system, iOS 11, that allows developers to create new AR apps. It’s a tech-limited tool, but ARKit can open the floodgates on a cascade of new AR-themed apps simply by having the update on millions of phones. And while it sees itself as a “camera company,” Snap is also the world’s best known AR company (think filters and Spectacles). The more accessible AR development becomes, the more Snap has to worry one of its core selling point becomes commonplace. 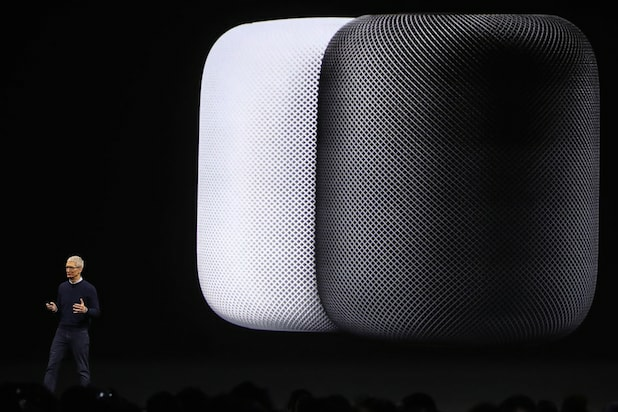 2) Amazon — As TheWrap noted earlier this week, Apple is making its play on the home speaker market with the launch of HomePod later this year. The nascent industry has been dominated by Amazon so far, with the company selling north of 10 million of its Echo speaker devices, according to Morgan Stanley. Between $130-180 a unit, that’s a nice chunk of change for Amazon, but the real value of Echo comes from its seamless ability to pull users back into Amazon’s core e-commerce business. At nearly double the price tag, HomePod will allow Apple to play the same game as Amazon. Apple has experience partnering with vendors — the iTunes store was built on the buy-in of music labels — and it’s always been able to funnel Apple customers towards its other products. Expect the HomePod to generate revenue beyond its unit sales in the same way the Echo does for Amazon. 3) Venmo — Apple may start to win over the elusive mom-market when it comes to transferring money over the phone. The upcoming Apple Pay update will allow users to send cash peer-to-peer directly through iMessage. Like Venmo, the money will go into an Apple Pay account, where you can transfer it to your bank. Apple didn’t say if it’ll be charging fees, but if it’s limited to credit cards like Venmo, it could spell trouble for everyone’s favorite payment app.